Heat oven to 450°F. Lightly grease 2 cookie sheets with shortening or cooking spray. In medium bowl, stir Bisquick mix, buttermilk and 5 tablespoons of the melted butter with fork or whisk just until blended. On lightly floured surface, knead dough 1 to 2 times. Press or roll dough to 1/2-inch thickness. Cut dough with floured 1 1/2-inch round cutter; place rounds on cookie sheets. Bake 7 to 9 minutes or until lightly browned. 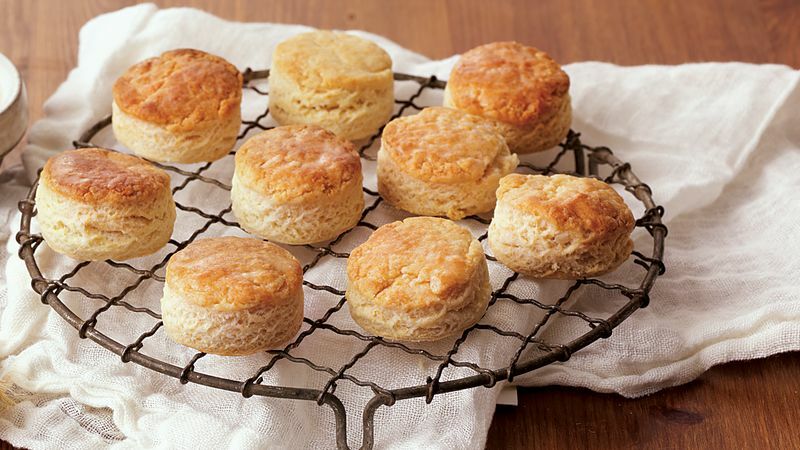 Brush tops of biscuits with remaining 1 tablespoon melted butter. Serve warm. Freeze unbaked biscuits on lightly greased cookie sheet 30 minutes or until frozen. Store in resealable freezer plastic bag up to 3 months. Bake as directed for 8 to 10 minutes.